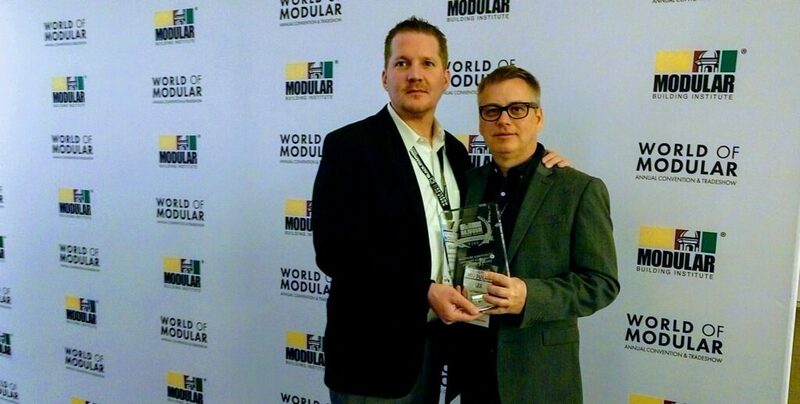 Panel Built, Inc. Takes Home First Place from World of Modular Conference! 4/4/2019-LAS VEGAS, NEVADA - At the Modular Building Institute’s annual conference, World of Modular, Panel Built, Inc. received a first-place award in recognition of one of their modular construction projects! With Lee Baenninger and Isaiah McPherson in attendance to accept the Award of Distinction, Panel Built took home first prize in the “Relocatable Modular Workforce Housing Under 10,000 Sq. Feet" category. Panel Built would like to thank the Modular Building Institute for this honor. MBI’s Awards of Distinction ceremony is the modular construction industry’s premier award show case. With over 100 different project entries, it is a fantastic recognition from some of the best minds in the industry. Each modular construction project in contention is carefully judged by a panel of professionals in the fields of architecture, construction, engineering, communications, and/or academia. The honor was awarded to a Panel Built project at the Burlington-Alamance Regional Airport in Burlington, North Carolina. Along with Tri-Lift NC, Inc., Panel Built provided a 3,800 Sq. Ft. two-story modular building, including two prefabricated, steel stair systems that offer access to the second floor. The building was constructed for the National Agents Alliance, an insurance and marketing firm that is located in the area. It is located inside the company’s own jet hangar and is used to provide lodgings to the company’s pilots after completing cross-country sales trips, and it offers a wide range of amenities and features. Using a decorator for the interior furnishings, the building contains is own sleeping quarters, restrooms, kitchen space, pool tables, flat-screen TVs, and bar. The top floor features custom, full glass wall panels, providing a clear view of the hangar floor below. So, along with their new facilities, the NAA received a luxurious space for their pilots and employees to relax after flights and host corporate events, while still having plenty of space to house their two corporate jets. Panel Built wants to get the word out to its MBI partners about our versatility. Everyone needs to know that if they don't have a conventional solution for their customers that they can call Panel Built, and we most likely will have a solution. The project was another gleaming example of the value Panel Built’s dealers provide to our projects. We would like to thank the wonderful people at Tri-Lift NC, Inc. for their work, ensuring this project was an award-winning success. Panel Built was founded in 1995 by brothers Pat and Mike Kiernan and began with the construction of pre-manufactured buildings. Today, Panel Built offers a complete line of custom modular offices, mezzanines, security booths, ballistic buildings, towers, cleanrooms, and more. Panel Built's mission is “To Solve our Customers' Space Needs with Excellence and Great Customer Service." Going forward, Panel Built plans to continue to take part in the World of Modular contest and aims for additional success in the future.